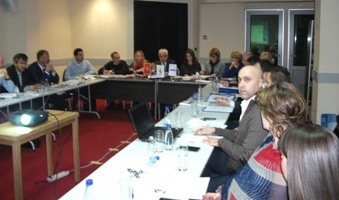 December 1st 2014 – Within the project “Best Practice Program in Local Government in Montenegro 2014”, the Union of Municipalities of Montenegro in cooperation with the Ministry of the Interior and with the support of the OSCE Mission to Montenegro, organized the Election Panel meeting in Podgorica, on 1st December 2014. Practices proposed for the status of best practices in 2014 in Montenegro were presented by the representatives of local governments. The meeting gathered members of the Election Panel: Mr. Senad Crnovrsanin (Ministry of the Interior), Mrs. Tatjana Vujosevic (Ministry of Sustainable Development and Tourism), Mrs. Zana Radulovic (Ministry of Economy), Mr. Igor Vucinic (Ministry of Labour and Social Welfare), Mr. Ana Novakovic (Centre for Development of NGOs), Mr. Svetlana Lausevic (OSCE Office in Montenegro) and Mr. Refik Bojadžic (Union of Municipalities of Montenegro). – Municipality of Zabljak – “Construction of Hall of Sports” – the practice is presented by Mr. Vasilije Jaksic. – Municipality of Niksic – “Transparency in the service of prevention of corruption acts” – the practice is presented by Mrs. Slobodanka Roganovic. – Municipality of Tivat – “Improvement of energy efficiency through the activities of local government” – the practice is presented by Mr. Petar Vujovic. – Municipality of Pljevlja – “Providing social services in the municipality of Pljevlja” – the practice is presented by Mrs. Slavica Krstajic. After the presentation of the nominated practices, the Election panel held a meeting where all nominated practices were analyzed in line with the established criteria. The Election Panel established the list of best practices for each thematic area. The Decision on the selection of best practices will be made on a special session by the Election Panel. All the participants in the Best Practices Program 2014 will be informed about the decision.